I hope all friends and readers of my blog had a good start into the new year! I look forward to continue the exchange of thoughts and ideas about photography, nature, and nature conservation together with you in 2019 again. Your emails and messages inspire me and sharing knowledge, photo locations, and helping each other is always fun! A couple days ago the word was spread on the internet that a large number of Bald Eagles was at Ice Harbor in Dubuque, right behind the Mississippi River Museum. I didn’t have time to go but tried to check it out yesterday instead. Bummer, there was not a single eagle at this place or any other location where we usually may have a chance to watch Bald Eagles along the big River. Because of the warm weather there is still no ice on the river and the absence of eagles isn’t really a surprise to me. Not a big deal, in January I was at lock & dam #14 in LeClaire, Iowa and had my good share of opportunities to photograph this majestic bird again. During the last days of the year I usually clean out my library, apply missing keywords, and put the last files away into the archive. And that’s where I found this image last night. If only sunset pictures or a rain of colors is on your mind, this one is not for you! It is a tradition for us to make a walk around Spring Lake in Cherokee, IA at Christmas time. We have seen this park and lake with great colors, blue or gray sky, and during very low temperatures in the past. This year was probably the warmest weather we have seen so far at this time of the year in Spring Lake Park. The ice on the lake and the old snow from some time ago make the viewer believe we had a white Christmas, but it was actually warm, slightly above freezing. Different than during other years was the fog on Christmas Day. In a lot of city parks we can find “items” that are a distraction, hurt the esthetic feelings, and last but not least, can ruin any photo. From the inescapable trash can to the ugly concrete park bench (that nobody uses because they are too cold on your rear end), Americans have sometimes a “great” way to ignore their best designers and landscape architects. I still think it is a nice park, but after retouching and cloning away distracting elements these thoughts became dominant. Because of the fog, much color wasn’t part of the picture, but I made the photo anyway with having black and white in my mind already. I trust you had a wonderful Christmas and the photographers among the readers of my blog had a chance to make a few clicks. Perhaps for some good memories, or maybe for the best photo you ever made. I hope you did! We spent the holidays in northwest Iowa with family again. Any time when I’m on the family farm near Remsen, Iowa, I look for light, clouds, or anything that puts some drama in the scene. One of my favorite backdrops is one of the neighboring farms. This time the sunset was right at this location, on a hill across the road. No, we didn’t have a white Christmas, but the remaining old snow and ice on the ground reflected the warm sunlight and gave the scene some depth. It’s often tricky to have the full sun in the frame. Blowing out the highlights is easy and without the snow, the foreground would have been just a dark and muddy mess. The photo was made after we celebrated the 99th birthday of Joan’s dad Joe Kass, a humble and hard working farmer, who worked the family farm for many years. Joe lives now nearby, in an assisted living complex, but I’m sure he has seen this sunset many times before on his birthday, the day before Christmas Eve. This will be the last part of my photo story about our trip through the mountains and grasslands of the west in September. I have quite a few more images but for this last post I wanted to use a couple photos that leave no doubt about where they were taken, OUT WEST. Both photos were made the morning of our last full day in Badlands National Park. A horseman, who camped in the same campground as us, went on a ride and gave his horses some exercise and a big American Bison, the iconic animal of the west, gave us a nice gesture with his tongue while interrupting grazing just briefly. I hope you enjoyed this journey and had as much fun as I had while stitching the 30 stories together. Your echo and opinions helped me to grow as a photographer and I’m thankful for everybody who stops here in the blog on occasion or every day. During my recent presentation at the Dubuque Camera Club about storytelling in wildlife photography I stated to take the camera with us, wherever we may go. I’m sure glad I did tonight when I took Cooper, the dog, down to the Mississippi River for a walk. The sun had disappeared already behind the bluffs, light was fading away fast, and I thought there wouldn’t be much to photograph. And boy, was I wrong! Hundreds of Canada Geese crossed the river in groups, flying towards the setting sun. There were at least two ways to make a click and tell the story, and I tried to accomplish both. In the western sky was the glow of the setting sun with some hazy clouds, and to the east, over the river, was the moon. The shot aiming the lens at the sunset was indeed predictable. The geese fly in V-formation and I wanted to bring that somehow in connection with the clouds and the sun light. The other photo, with the geese flying “through” the moon, required a little bit of luck. Many flocks crossed the Mississippi this evening and I just waited for the right moment. You can’t really pan with the camera, follow the flock, and shoot with a slower shutter speed in order to keep the ISO low and the digital noise out of the picture. This would result in an even more blurred moon. I had to set ISO to 800 for maintaining a shutter speed of 1/500s. Not that this one is perfect, but it was pretty much how I saw it with the thin layer of haze in front of it. Sure, this is only a picture taken at a bird bath but this is a favorite place of the four Eastern Bluebirds that visit our backyard frequently. They come in to drink and quite often sit at the edge of the pool and warm up a little. I have photographed them many times but this is the first time that I was able to make a photo of a female and male side by side and both birds in focus. Yesterday, at the turn around point of my trip along the Mississippi River, in the city of Fulton, IL, I stopped at the Dutch windmill that was built on a flood control dike. “De Immigrant” was fabricated by native millwrights in the Netherlands and shipped to Fulton, Illinois. It was assembled in 1999 and grinding of wheat, buckwheat, rye, and cornmeal started in 2001. It is a great attraction but the mill and the Windmill Cultural Center were closed for the season. The sun was out today and with temperatures just below freezing and hardly any wind we had great conditions for a cruise by car along the Mississippi River. I checked well known locations, like the Green Island Wetlands, but moved on further south on the Illinois side of the river all the way to Fulton, IL. My goal was to scout some new marshes and backwater areas on the east side of the big river and I found quite a few places that look promising for future bird watching and photography trips. This woodpecker was busy high up in an oak, right along the river banks in the campground of the Thomson Causeway Recreation Area. The Red-headed Woodpecker can be found in our area all year long but we have seen them only occasionally during migration time. This bird wasn’t alone, I could hear the “queer-calls” of at least another one and a gentleman told me that he had seen several Red-headed Woodpeckers earlier this week. 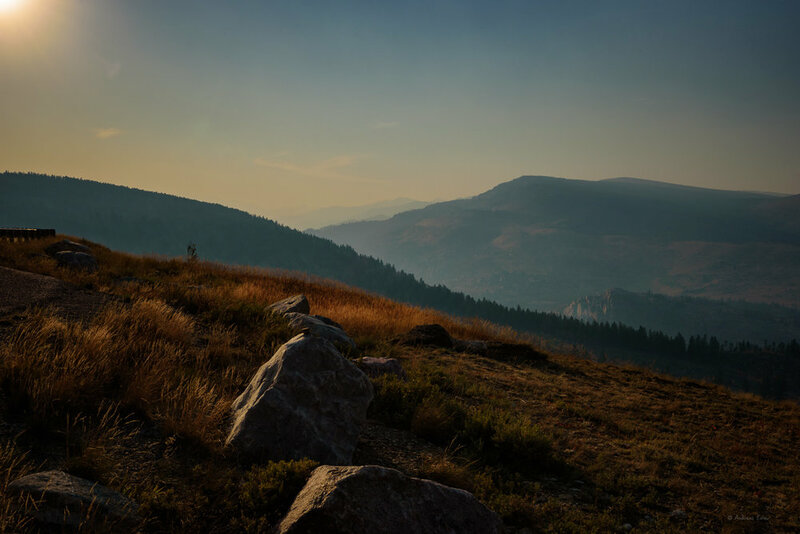 Our last destination in the mountains of western Wyoming was the Wind River Range, an approximately 100 miles long part of the Rocky Mountains. We pitched the tent for three nights in Sink Canyon State Park, west of Lander, WY. These mountains are not so well known by the public as for example the Tetons or Yellowstone, but there is no lack of interesting geology and beautiful nature. We went on hikes and traveled off the beaten path by car, but time was too short to explore more than a small area of the range. Finding wildlife is not very difficult in the Wind River Range, there was always a Pronghorn or Mule Deer somewhere, but when we saw this doe with her two fawns on a rock ledge in the Red Canyon near Lander, WY we had to stop and make the click. Mountains Lions are not uncommon and are a great danger for the young Mule Deer and this spot was obviously a good place to have control over the terrain for the mother. The Least Chipmunk is smaller than the Eastern Chipmunk that lives in our woods here in eastern Iowa. 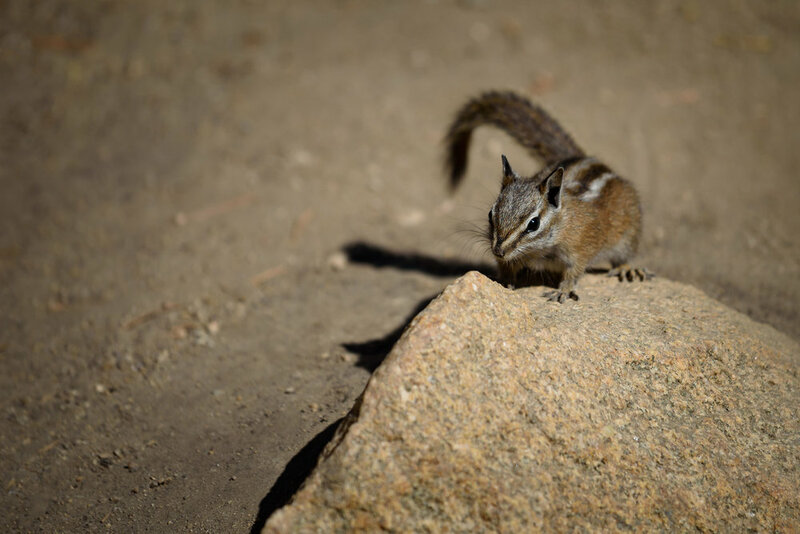 In areas that are more frequented by people, like along the hiking trail that leads to the Popo Agie Falls, the chipmunks have not much fear and can be easily photographed within the range of a 200 mm lens. Before the year ends I like to finish my little series about our trip to the mountains and grasslands out west in September. It was the third time Joan and I visited the Grand Tetons together and it was totally different than during our last visit eleven years ago. In 2007 we were lucky to have the first fresh snow of the season while the trees still had their fall colors. This made for some great photo opportunities. This time the leaves just started changing and we were too early for new snow. I had a little break here in the blog and come back with some street photography. Dubuque had its ‘Merry Millwork Market’ during the last couple evenings. 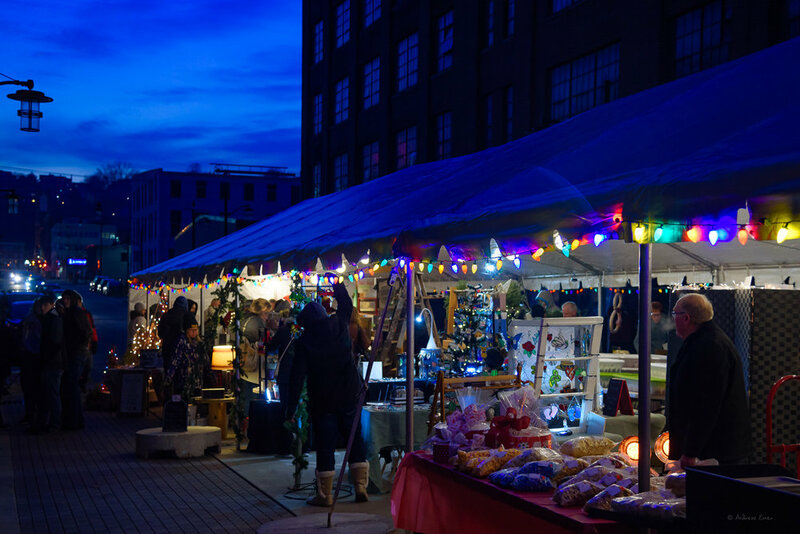 Joan and I went yesterday night to this mini- Christmas market in the Historic Millwork District. Let me go straight to the highlight 😉. It was the first time since I live in the US that I saw someone selling Glühwein. The mullen-spiced red wine is served on every Christmas market in Germany, something I have missed during the last fourteen years. I thought the market was well done, taking place outdoors and indoors. There were a lot of local artists selling their artwork and it seems the character of the market fits the ambience of the repurposed warehouse buildings in the Historic Millwork District of Dubuque, Iowa very well. I don’t know when I shot the last time with ISO 1250 and still hand held the camera at a shutter speed between 1/15s and 1/40s. Detail was not so important as it is in wildlife photography and I wanted to keep the mood intact by using only the ambient light. GREEN ISLAND WETLANDS IN THE WINTER? I had a nice audience last night for my presentation about storytelling in wildlife photography, with some great questions afterwards and the emails and messages I received today tell me that people received some inspiration for their own photography. This made my day! I introduced some of my favorite shooting locations, and the avid reader of my blog knows already, the Green Island Wetlands along the Mississippi River play certainly an important role in my endeavors. Actually Joan, our dog Cooper, and I went there for a little hike last Sunday. We had some fresh snow on the ground and most water bodies were covered with a thin layer of ice. I’m sure the duck hunters were not so happy about that because we didn’t see any. So what can we find at this time of the year under winter conditions in Green Island? We saw several hawks, a few Song Sparrows, and for the first time ever a coyote on top of a levee. Unfortunately he had seen us earlier and during the two or three seconds we watched him I was not able to make a sharp image. Ten minutes earlier this Bald Eagle posed nicely against the blue sky and later we saw the bird with its mate sitting in another tree further away.